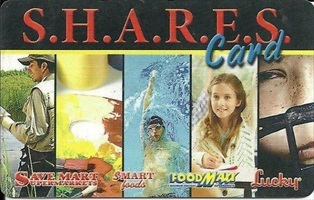 S.H.A.R.E.S., is a fund-raising program offered free to more than 8,500 schools, groups and organizations by Save Mart and their affiliated stores (Lucky Supermarkets, FoodMaxx and S-Mart Foods). Each year, they set aside a reserve of $4.5 million specifically to benefit those who have enrolled in S.H.A.R.E.S. S.H.A.R.E.S. is an acronym for Supporting Humanities, Arts, Recreation, Education and Sports, and it is Save Mart’s way of giving back to the communities we call home. It is really quite simple. You can receive a card from us at the theatre, call and ask for one or simply fill out the form below. When you shop at Save Mart, Lucky's, or Food Maxx swipe your card and El Campanil Theatre will earn 3% of of your purchases. No registration is involved.